Heat oil in a pan and splutter mustard seeds and urad dal. Add curry leaves, chopped ginger, green chilly and onion and saute for 2 minutes. Then add chopped carrot, beans and salt and saute for 4-5 minutes on medium flame. Add 2 cups of water and when it boils, add roasted semiya and mix well. Cover and cook on low flame till the vermicelli and veggies are soft and all the water evaporates. Garnish with chopped coriander leaves and remove from flame...Serve hot.. 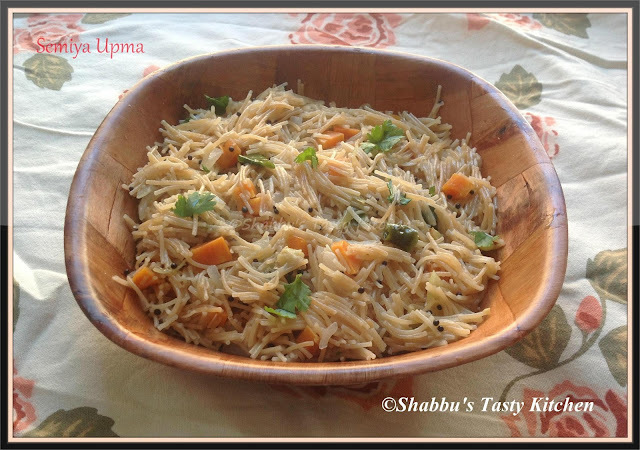 If the vermicelli is not roasted, roast it using 1 tsp of ghee until light golden brown..